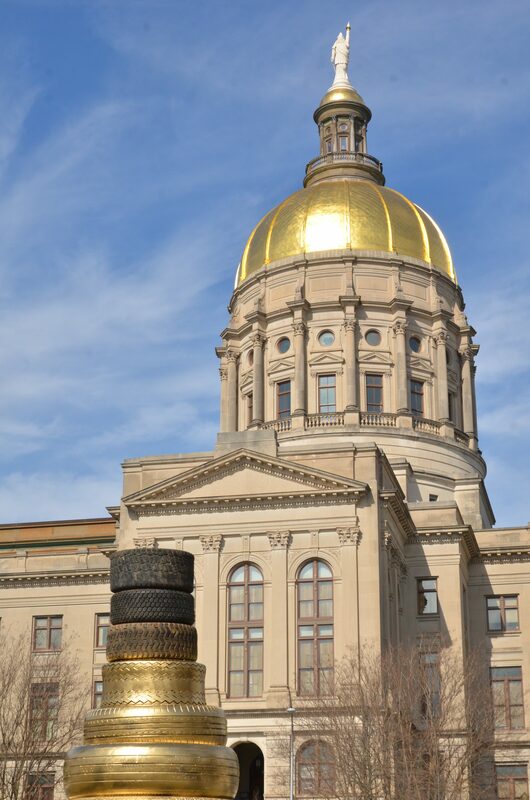 In an effort to bring attention to legislation aimed at restoring funding for state clean community programs, volunteers with the Georgia Water Coalition (GWC) plan to hold a 24-hour marathon scrap tire roll at the state Capitol beginning Feb. 28. During the event, individuals will push a large tire around the sidewalks surrounding the Capitol continuously from 8 a.m. on Feb. 28 to 8 a.m. on March 1. The roll will end as the GWC’s Capitol Conservation Day begins. Capitol Conservation Day annually brings advocates from across the state to the Capitol to meet with legislators and urge them to support legislation that protects Georgia’s water resources. The free event features a complimentary breakfast, information workshop and a visit to the Capitol to talk with legislators. One of the issues organizers hope to press lawmakers on is HR 158, a measure sponsored by Rep. Jay Powell (R-Camilla). HR 158 would create a constitutional amendment allowing legislators to “dedicate” fees when they adopt laws that include collecting fees or fines from Georgia citizens. Currently, legislators can adopt laws collecting fees for specific programs, but are unable to ensure that the funds collected are appropriated for their intended purpose. As a result, programs like the Hazardous Waste Trust Fund and Solid Waste Trust Fund designed to cleanup toxic waste sites and illegal tire dumps are regularly short-changed during budget writing. Since being adopted in the 1990s, the two environmental funds have collected about $500 million from citizens, but about $200 million has been diverted to pay for other portions of the state budget. This diversion leaves dozens of sites across the state awaiting expensive cleanups. HR 158 passed the house on a 166-1 vote earlier in the session and has been assigned to the Senate Appropriations Committee. Since October, over two dozen local city and county governing bodies have adopted resolutions supporting HR 158, including Columbus, Atlanta, Cartersville and Valdosta. City and county governments often depend on state funding from the environmental trust funds and other fee-based programs to complete projects in their jurisdictions. CRBI is providing complimentary shuttle service from Rome to Atlanta and back for those interested in attending Capitol Conservation Day. Interested parties should contact Jesse Demonbreun-Chapman at jesse@coosa.org or at 706-232-2724.